Divorce troubled her and the Haristeen divorce especially, since both parties were decent people. That is sad, I am a legal assistant so I know how she feels. I have quite a few of these books on my bookshelf but I have never gotten around to reading them. There is a new Rita Mae Brown out as well Hiss of Death. The Sneaky Pie series is fun. I remember a little of this one. Luv this series with the two dogs and one cat. Can’t remember their names. Is one Pewter? Haven’t read the whole series. Did you see Rikki Lake in the movie? 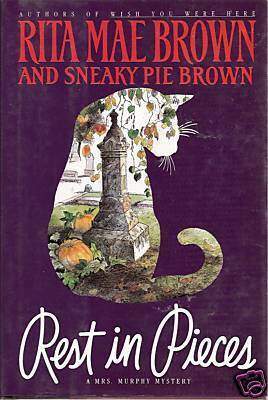 I haven’t read anything by Rita Mae Brown in a long while, and haven’t read this particular series…but now I’m twitching to grab one! haven’t tried a rita mae mystery. love this cover.